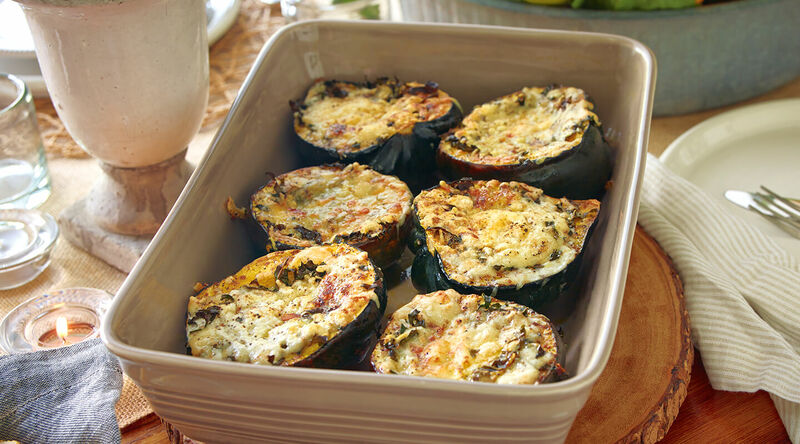 Brighten up your holiday meals with a festive and comforting acorn squash side dish stuffed with a delectable kale and alpine-style cheese filling. They’re so pretty and easy to prepare; your guests will think you fussed for them. Look for the Proudly Wisconsin Badge when shopping for cheese. Any brand of Wisconsin Grand Cru® can be used in this recipe. Cut each squash in half; remove seeds and discard. Brush halves with olive oil; sprinkle with salt, pepper and nutmeg. Place squash halves, cut side up, on a parchment-lined 15 x 10-inch baking pan. Bake for 30 minutes. Meanwhile, remove ribs from kale; discard. Slice kale leaves into thin strips. Remove squash from oven. Sprinkle half of the Grand Cru® Original into squash halves. Stuff each half with about 1/2 cup kale. (Save any leftover kale for different dish.) Sprinkle with the remaining Grand Cru® Original. Drizzle each squash half with 2 tablespoons cream. Season with additional salt, pepper and nutmeg as desired. Bake for 55-60 minutes longer or until squash is tender and filling is bubbly. Serve immediately. Any brand of Wisconsin alpine-style cheese can be used. Lacinato kale is also known as black, dinosaur or Tuscan kale. Roth Grand Cru® Original cheese is made in copper vats and aged for over 4 months. It has a robust flavor with light floral notes.